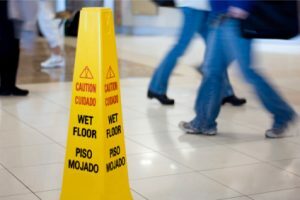 Workplace slips and trips are one of the most common causes accidents at work. Your employer has a duty to ensure that you are safe at work and this includes minimising the risk of accidents at work especially slips and trips which are often easily avoided. If you have had a fall at work and your accident is due to the negligence of your employer then you may want to consider making a workplace injury claim. You can find more detailed information on compensation for slips and trips here or explore the links below for further advice and information on your specific situation. Call us for a confidential, free, no obligation chat if you would like to discuss your accident at work further and we can advise you how we can help. Error: Error validating access token: Session has expired on Saturday, 09-Mar-19 13:12:58 PST. The current time is Thursday, 25-Apr-19 10:10:55 PDT.